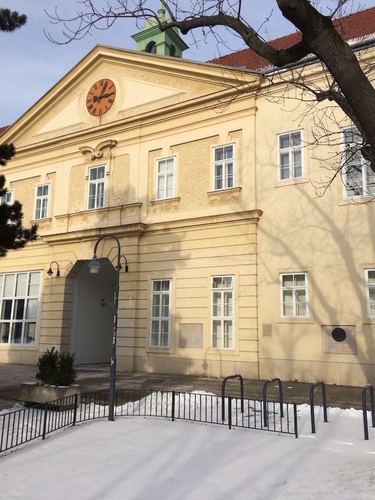 A memorial tablet of Ferdinand Ritter von Hebra, one of the main exponent of the modern dermatology, can be seen in the main courtyard of the Old Vienna General Hospital in Vienna. 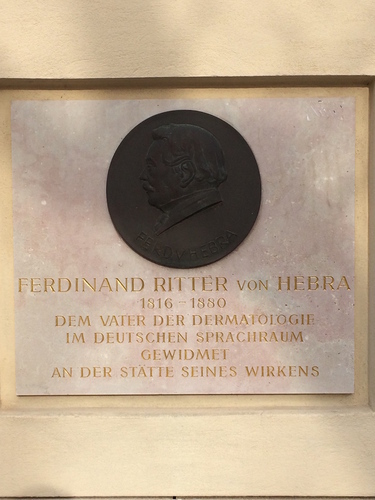 The German inscription on the tablet reads as follows: "FERDINAND RITTER VON HEBRA / 1816-1880 / DEM VATER DER DERMATOLOGIE / IM DEUTSCHEN SPRACHRAUM / GEWIDMET / AN DER STATTE SEINES WIRKENS" (Ferdinand Ritter Von Hebra (1816-1880). Dedicated to the founder of dermatology in the German speaking territories and in the places where he carried out his medical activity). Photos and main text by Nicoletta D'Angelo ti.liamtoh|3x_yhcin#| and Paola Infantino ti.liamtoh|41_nollop#| (December 2014).